We set out our homes to reflect our values and re-present what we hold dear, and in doing so we get used to things and cease to question how what surrounds us might look to others. It is an aspect of photography that it has the ability to unpick this - to isolate things and cause us to look again. This extraordinary thing is in an ordinary home, next to scores of other ornaments, keepsakes and mementos of holidays. 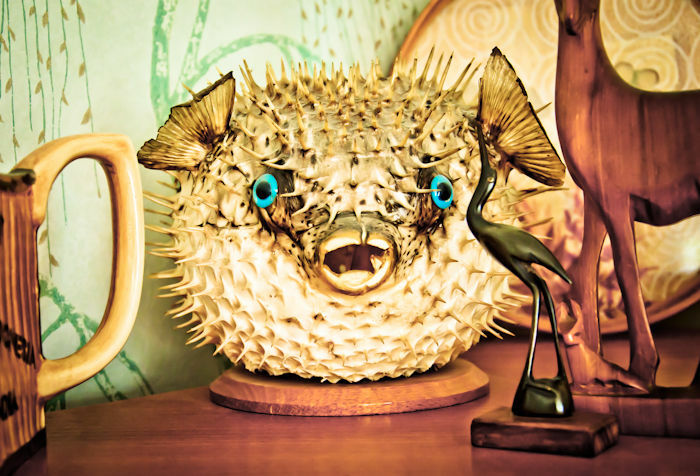 What adds to the bizarreness of it is that this kind of fish inflates itself like this in moments of extreme terror. The ornament it has become therefore captures the beast looking terrified - at the point of death perhaps - and it, in its appearance, sends a strange sense of shock to us in turn. It is frozen forever in terror, but it is small and within our control, so it looks absurd, possibly funny, perhaps anthropomorphic - a startled cartoon face, maybe - but at the same time still alarming, once you look at it carefully. Dead animals are, one would think, a strange thing to decorate one's home with; but this one especially.